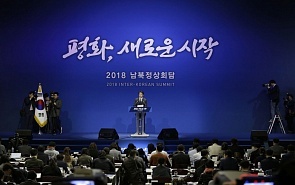 The inter-Korean summit, due to be held on April 27 on the border between the two countries, will largely play a symbolic role, Valdai Club expert Georgy Toloraya said in an interview with valdaiclub.com. A historic meeting between the leader of the DPRK Kim Jong-un and the President of the Republic of Korea Moon Jae-in will take place in the border village of Panmunjom on Friday morning. However, the significance of this meeting will be rather symbolic, believes Georgy Toloraya, professor at the MGIMO University of the Russian Ministry of Foreign Affairs, Executive Director of the Russian National Committee on BRICS Research, Director of the Center for Asian Strategy at the Institute of Economics, Russian Academy of Sciences. Toloraya noted that issues of mutual cooperation would be undoubtedly discussed at the summit, and some “high-profile declarations” can be adopted. “But the real success of the summit will be clarified only when we find out whether the meeting between Kim Jong-un and Trump really takes place, or not,” the expert concluded. Are Donald Trump and Theresa May ‘Hostages’ to Their Countries’ Legislatures?